The Stiebel Eltron SHC-4 mini-tank point-of-use water heater is ideal for bathroom sinks, kitchens, commercial washrooms, and a wide range of other point of use applications where only a small amount of hot water is required during each use (hand washing, etc.). Due to its small size, the SHC-4 conveniently fits directly under the sink or adjacent cupboard or closet, so it delivers hot water to the sink almost instantly. By locating the heater right near the point-of-use, you can also eliminate thermal heat loss commonly associated with long pipe runs. If the SHC-4 can supply all of the hot water needs for the room, in new construction applications, you also eliminate the need to run a hot water line all the way from the main central water heater which can save you significant money in plumbing and material cost. 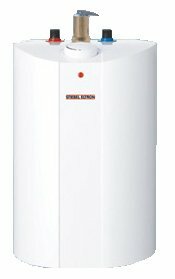 The Stiebel Eltron SHC-4 Mini Tank Water Heater features a glass lined tank and excellent insulation to substantially reduce stand-by heat loses in comparison with conventional tank water heaters. Lightweight and compact, the SHC 4 mounts to directly to the wall or the side of the cupboard with a sturdy bracket (included). Once it is filled with water, simply plug it into a standard 110-120V electrical outlet. With only an 11 AMP electrical current draw, no special wiring is necessary! Temperature & Pressure (T & P) valve included. *Please note: The SHC-4 can be plugged into a standard 110/120v electrical outlet however, we recommend that the outlet be dedicated to the water heater.